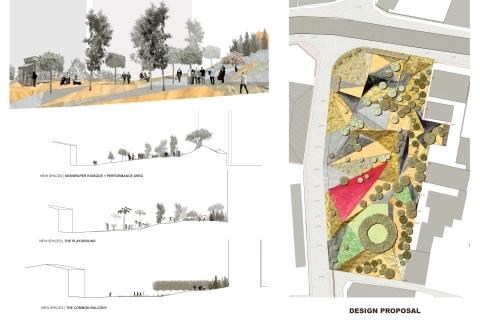 Designed to re-integrate the fading public park space of Beirut into the dynamic and rapidly industrialized urban grid, this project proposes remolding one of the largest public parks in Beirut, located in Basta, into gripping its direct and regional context. 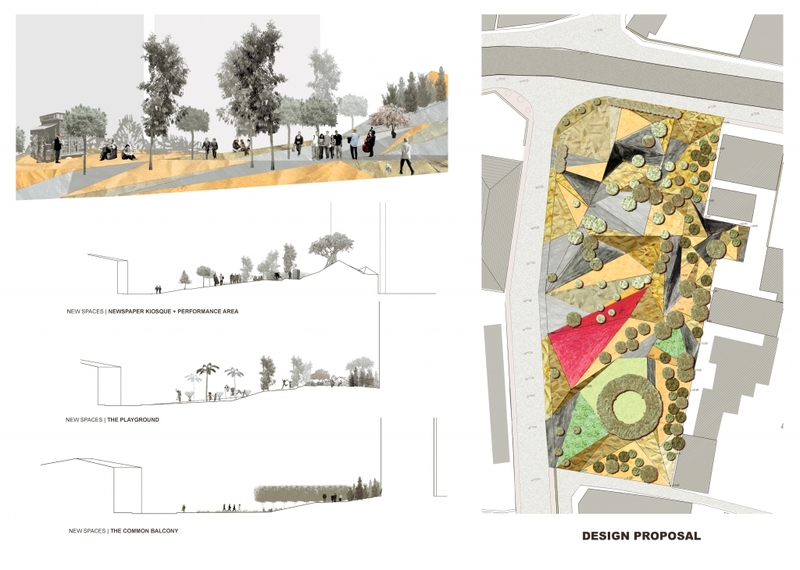 The design aims at providing adequate visual and spatial use and accessibility to the park, as well as responding to both the multidisciplinary needs of Basta’s active community and multiple contexts, with a consideration to the park’s notable topography. The city of Beirut has an urban climate that has undergone drastic internal changes across its modern history. In fact, the function of the public garden in Beirut does not have the same impact on the urban community as it did in its period of creation back in 1961, because the need and attitude towards public gardens and public space has changed. Half a kilometer away from the Beirut’s central district, Basta is a side of Beirut known to have a differing appearance from its nearby regions, where investment in development is more prominent. Its sense of traditional authenticity strongly manifests through both the scattered architectural remains of the city’s old era, with a long street of antique shops filled with objects of discovery extending from the entrance to Basta, for which this region receives genuine appreciation. However, the traffic congestion in Basta and the informal use of the public space gives a sense of roughness to the area, leaving it with a reputation to be uninviting to outside wanderers. 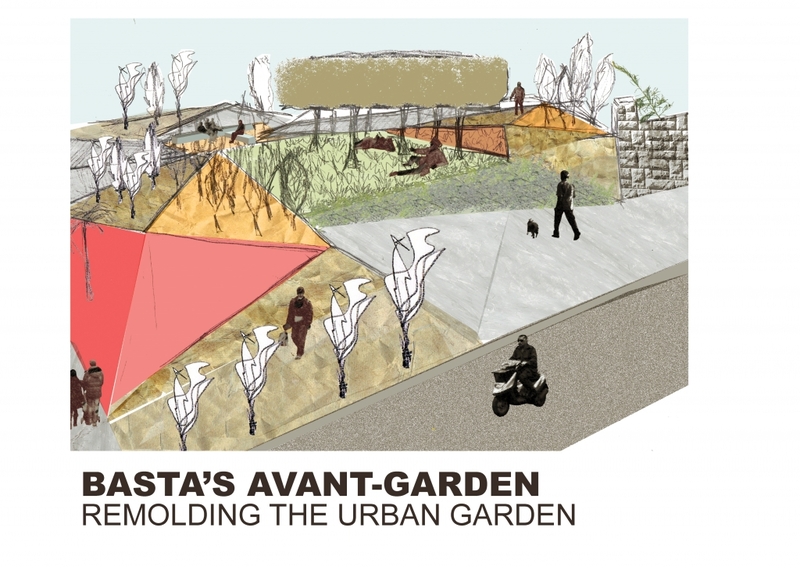 Although having two public gardens, including the studied site, Basta suffers from a lack of open space gatherings. This suffocation is due on one part to the dim use of the gardens with a preference to occupying the narrow sidewalks of the area, and to the governance of the vehicular network over the pedestrian passages. A viridian green metal 1982 bridge cuts the area into two parts, one part consisting of the antique souk street, and the other part being more residential. The presence of the bridge causes a strong interruption of the potential pedestrian flow in between the two parts. Considering the grid of urban gardens in Beirut, the Basta garden is the third largest one to count. Across its 7,000 m2 surface, it descends over a 7% slope. Its current design divides the slope into five different levels, each separated by tall wall terraces and connected by staircases. 85% of the total surface consists of topcrete floor, mainly painted in a mahogany hue. The space overall is dominated by walls and hardscape. In order to satisfy the topography, a prominent wall secludes the garden from the exterior zone, with added fences for security reasons, reducing the visibility and the accessibility to the garden. The inner-spaces have an appeal of outdoor rooms, with benches scattered over the different areas in the logic of following the outline borders of the given space. The new design targets these issues, as well as the sense of scale inside the garden, which currently has the aspect of a small setting, stretched over a large area. 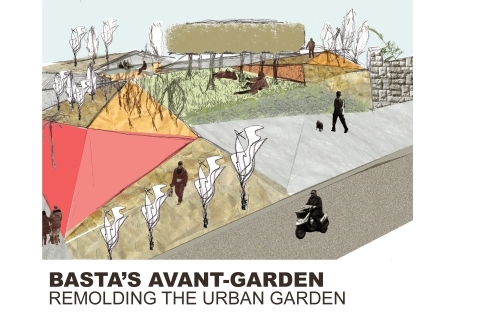 The new design for Basta’s urban garden has the purpose of firstly being an appropriate platform that satisfies the recreational needs of the regional dwellers, providing activities that can satisfy the diverse use on space. A core principle to the new garden is to avoid rough borders both inside and outside the space, preferring instead the use of trees as visual and accessibility fencing, and interactive surfaces that link the different levels together, with a network of engaging promenades on ramps brushing a multitude of heights across the garden space. Finally, the new Basta urban garden is a luscious green breathing platform for all age groups and purposes, acting as a sink that transforms Basta’s urban tissue into a more people-friendly place, giving the dwellers an open zone to meet and condense the genuine character that makes Basta a favorite place for seekers of the authentic vintage side of Beirut. Moreover, the Basta garden has a critical context. Standing in the middle of a diverse, multi-use space, all of the residents of Basta including the outside visitors mostly visiting the souks stroll in the area surrounding the garden. In fact, on the northern edge of the site lies the antique market street, abruptly separated by the green bridge. Across the street of the garden, the Basta public elementary school is located, bringing in a large number of the neighborhood children. At the southern part, the area’s sense of place becomes increasingly residential, with a calmer flow than in the commercial area at the other end. The eastern part of the garden has an interesting feature: the actual edge of the garden is bordered by side façades of residential buildings whose setting grows increasingly informal from north to south – the public space experiences an invasion of buildings on this side of the garden. In its current state, the Basta garden as a context is like an island forms a blank interruption to its surroundings, due to its physical design, and to its lack of complementing the outer-dynamics with a harmonious flow. 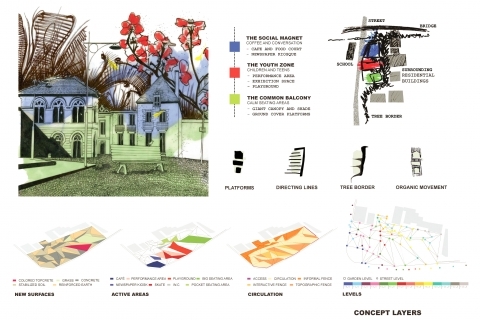 In order to re-contextualize the garden into its specific zone, the design program aims at re-defining the site into responding to three specific contexts identified. The first zone, located on the northern side, at the edge of the vehicular bridge, consists of a strong social hub that brings people together over coffee, street food, and conversation. 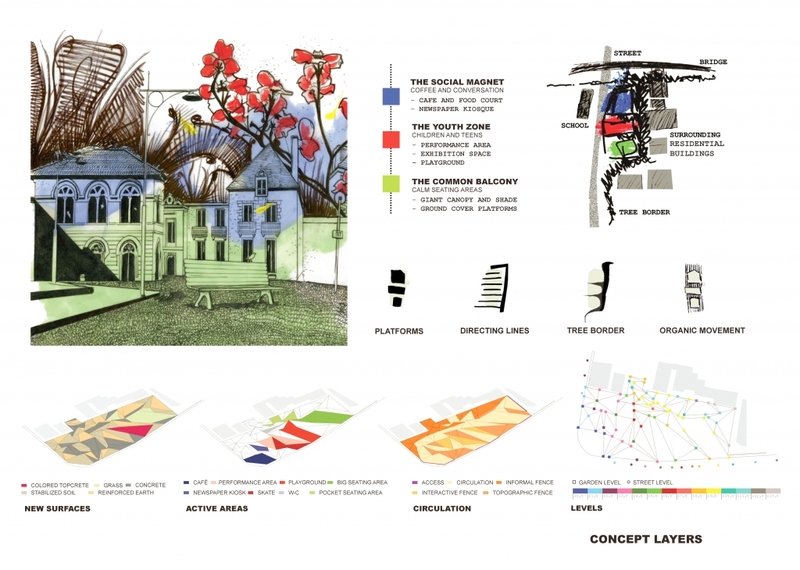 The second zone extends from the school to the garden, inviting the young generation into a playground, a circular performance space, and an exhibition area. The third zone is the calm spot of the garden, attracting the local residents to meet on the lawn shaded with the garden’s large circular topiary that is made out of Fig trees. 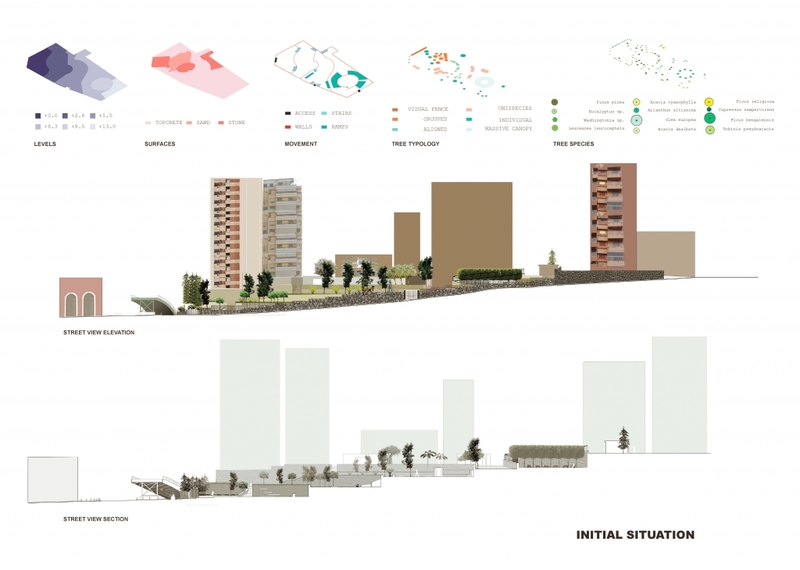 These three zones are open over three different levels, making the area more visible, flexible, and accessible. Finally, a thick layer of trees provide an informal border to the eastern region of the garden, satisfying both building residents and garden dwellers with privacy and a visual blend of greenery.